Fits approx. 10" - 14" wheel rims with tyre sizes 155mm to 205mm. Recommended for most car/ vans caravans, horse boxes (motorised), and Leisure trailers Boat, camping, Horse Box, Jet Ski and Motorcycle. Fully adjustable set once only versatile heavy duty triangulation clamp. Sold Secure tested and approved. Insurance approved and independently tested. Fully adjustable for wheel diameter and width. Electro plated arms for rust protection. Robust heavy duty steel construction. High security pick free lock, dust, water and corrosion proof. Robust Plastic storage case included. 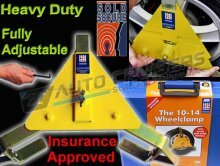 Can be used in conjunction with any stronghold Hitchlock, Leglock, Hitch post or Security post. Colour Ral 1023 yellow polyester. Lock: Flat key high security push lock. Electro Plating: Zinc and clear passivation to BS1706 Fe Zn 8c. Depth: 210mm (min) 270mm (max). Width: 620mm (min) 690mm (max). Please be aware when purchasing that some wheels may not be compatible with these clamps - even if the correct size is selected. They are designed to fit standard wheels but in some instances they may not fit and we cannot guarantee compatibility with all wheels. For clamps that don't fit: If care is taken when attempting to fit and it remains in as new condition, we will accept returns for full refund as per our return policy.